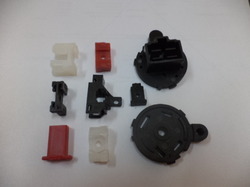 We are offering the quality range of Injection Mouldings. 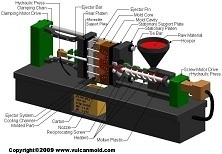 These mouldings are made by high grade material with international parameters. these are used in many industries for different usages. These are available at the industries leading price. Specs : Maximum Stroke: 32", Mold Height No Box or Spacers / Ejector Box + Spacer 9-1/2"
The group has deployed advanced Microprocessor controlled Desma Rubber Injection Moulding machines of upto 250 Tonnes. Depending upon the nature of the product, machines are run on fully automated processes right from compound feeding to product removal from the moulds. Speculum is in process of setting up top quality moulding machines with presses ranging from 50 tonne to 250 tonnes. To minimize problems we project manage the design of tools with tool manufacturers, taking the product through all the stages of design, through to PPAP and into final production. It is this attention to detail that sets Speculum apart from its competitors.